A disassembly of the new Apple TV 4K shows not only the improved processor in the device, but a completely redesigned cooling solution complete with "serious thermal venting" plus a fan. The fan in the device is the first of its kind in any Apple TV. 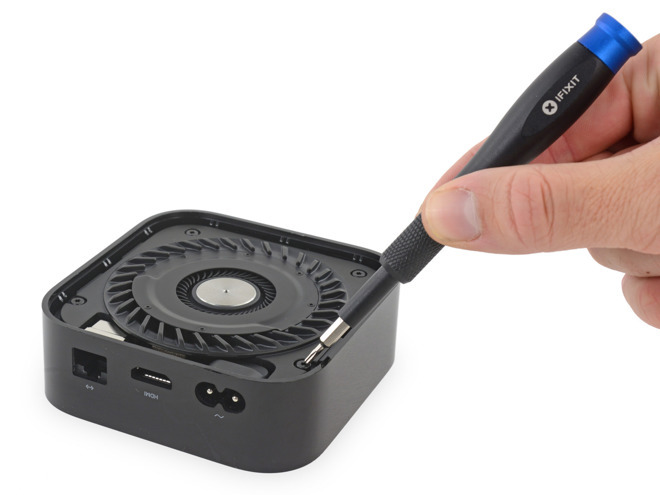 The new thermal solution in the Apple TV 4K combines the fairly large fan with the heat sink and EMI shield combination from the fourth generation device. Chips inside the device include a Broadcom Thunderbolt to Gigabit Ethernet chip, 3GB of SK Hynix RAM, a custom memory controller, a Murata wi-fi and Bluetooth module, Toshiba flash memory, and a Megachips DisplayPort 1.4 to HDMI 2.0 converter. 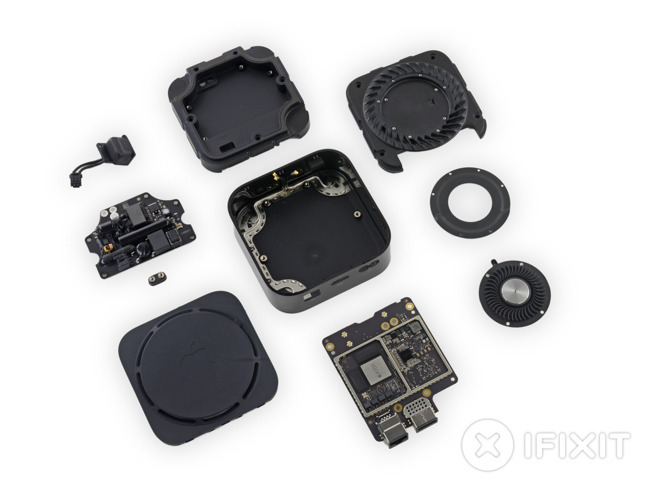 Regular disassembly guide and repair part purveyors iFixit gave the Apple TV 4K an eight out of 10 on its repairability scale during Tuesday's breakdown of the device. Positives include no glue, modular components, a modular power supply, and standard Torx screws holding the device together. As with nearly every other piece of electronics produced in the last five years, all major components are soldered to the logic board, necessitating board-level soldering or a full-board replacement if there are any issues. The new Apple TV 4K was announced during the Sept. 12 iPhone 8 and iPhone X release event. The device can play back 4K content at 60 frames per second, and supports Dolby Vision and HDR10. Apple has said that streaming 4K content from iTunes requires a 25 megabit per second broadband connection as there is at present no way to download the movie prior to watching it. AppleInsider is working on an in-depth examination of the device.